Clu continues his Rivalry Trophy Series, this week we head to New Mexico. What is the Rio Grande Rivalry? 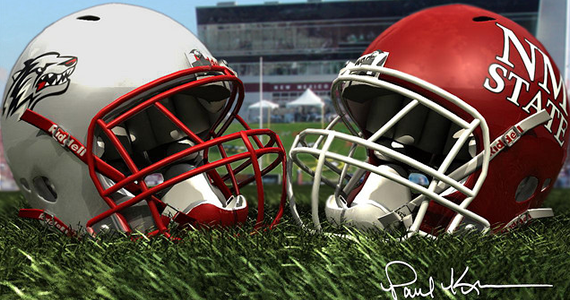 This rivalry actually began on Jan 1, 1894, approximately 18 years before New Mexico was even a state! The contest was between Univ. of New Mexico and New Mexico A&M (NM A&M would later become New Mexico State in 1959). While it is clear that the University of New Mexico won this game, the schools history records appear to disagree on what the final score of the game was. According to Univ. of New Mexico’s media guides, the final score was 25-5. However, New Mexico State’s media guides say the score was 18-6; Not that it matters really. If you lost by 20 or by 12, you still lost, guys! Stop complaining about it. Some of the more interesting facts that I found out about this rivalry dealt with the periods of success that both schools seemed to have. Often times each school would win 3-5 consecutive games. One of my most interesting finds was that in 1917 New Mexico State defeated New Mexico by a score of 117-3. Only 117 points? Did the Lobos (if they were called the Lobos in 1917) even try playing defense? What’s even crazier is that this wasn’t the highest scoring affair in college football (that I could find at least). In 1916, Georgia Tech beat the Cumberland College Bulldogs 222–0, (you can find out about that a little bit more here) The Rio Grande Rivalry is also better known as the Battle of I-25 since both schools are located near that interstate highway. How Competitive Is This Rivalry? If I must say so myself, this rivalry is very competitive. It is harder to find sports rivalries that transcend into sports other than football, but this is one of those situations where the rivalry goes across the board. In Mens hoops for example, the Lobos hold a 112-95 advantage all-time over the Aggies. Apparently, games at University of New Mexico’s “The Pit”, the fans get pretty intense when they face their in-state rivals. Just check out the video! I also discovered that they even started a championship through this rivalry! UNM competes with NM State in each collegiate varsity sport through a points system, and whomever gets the most points (of course) wins the Rio Grande Rivalry trophy for that year. 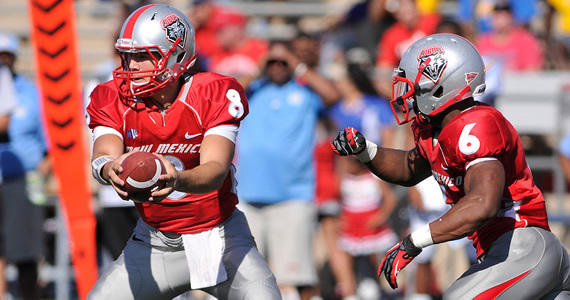 Since it started in 2007, it hasn’t left the Albuquerque, as the Lobos have dominated. Is there anything they can’t to do against the Aggies? Talk about being that big brother who never lets any of his younger siblings win! New Mexico has an advantage with their two headed running attack. It is led by Freshman QB Cole Gautsche, who leads the team in rushing with 159 yards and 2 rushing TDs. The Freshman from Rio Rancho needs to step it up on the passing attack though, as he is just 1 for 7 with a lonely interception. They will need their other running back to step it up if they do hope to pull off the win against the Aggies, but don’t worry everyone, the other guy is actually a running back! Junior Demarcus Rogers showed his star power in the opener against Southern University when he ran for 103 yards and 1 TD on 13 attempts, but since then UNM’s running game has done nothing against both Texas & Texas Tech. The Lobos rushing attack ranks 32nd in the nation, so they will need to rely on a well balanced attack against the Aggies if they want their second win of the year. The big question is if the injured Rogers can play or not. New Mexico State has a little bit more of a balanced offensive attack compared to their in-state rivals. They are led by sophomore QB Andrew Manley, who’s be nothing short of his last name as of late. He’s thrown for 789 yards and 7 TDs in 3 games… not too bad if I must say. His favorite target has been Austin Franklin (20 catches, 415 yards recieving, 5 TDs), who is one of the brightest stars of the Aggies WR corps. I mean NM State isn’t terrible at scoring points, as they rank 49th in the nation (according to ESPN), but they need to step up their defense (which is ranked 109th in points against) in order for them to actually win some games. Defense is kind of important in football. For example, in the last two games, the defense has allowed 92 points. It’s kind of hard to win then you need to score 50+ points a game to win. This isn’t basketball, people! The Aggies have beaten the Lobos in each of their last three meetings, but do the Lobos have the offense to match up with New Mexico State? No, I don’t think so, and we’ve see that in the first three games of the season. The Lobos struggled to put up points against Texas and Texas Tech. Now, don’t get me wrong; I know those are two top tier programs, but at least find some way to score! Judging on how great both New Mexico school are on defense, I say the team who makes the least amount of mistakes and can throw the ball for some points wins this one. 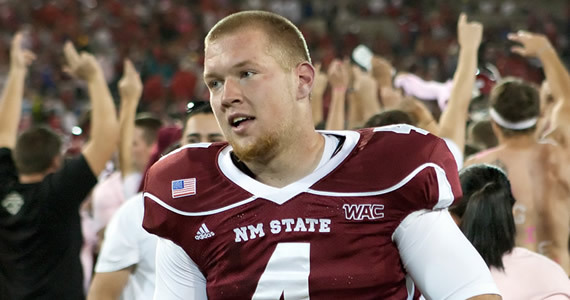 I think that will be New Mexico State.